The Mos Eisley cantina in Star Wars certainly had a motley bunch of alien patrons, so what would it be like to have to wait on them? In Star Wars Cantina, you’ll have to think quickly to have a chance at keeping your demanding customers happy. 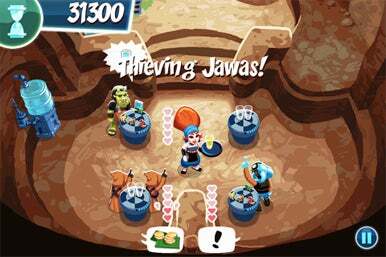 Star Wars Cantina by THQ Wireless under license from LucasFilm is a time management game where you must manage a busy cantina on Tatooine in the Star Wars universe. Seat guests, take their orders, collect payments, and bus the tables and do so as quickly and efficiently as possible. Fail to do so, and patrons will grow impatient and cost you business. In the career mode, you must earn enough money to advance to the next round. In between rounds, you can spend this money on upgrades to the cantina. An "endless shift" mode is also available — it skips the levels and challenges you with endless waves of customers. Time management games are plentiful, and Cantina does little to deviate from the basic formula. Placing the action in the Star Wars makes for a fun twist as you see familiar characters from the movies and listen to the recognizable cantina music. Control is very simple — simply tap on the different locations to perform actions. The game screen extends past a single screen so you’ll be constantly moving between two areas of the cantina. This is a little awkward at first, but it enabled designers to enlarge the graphical elements and allow you to see the clever animations. While you’ll see familiar groups like jawas and stormtroopers, don’t expect any of the main cast to be dropping by anytime soon. If you’ve played other games in this genre like Diner Dash, you won’t find anything new with Cantina beyond the setting. For Star Wars fans unfamiliar with this genre, give Cantina a look. Unlike some games, it doesn’t get overly complicated with extensive tasks and upgrades making it is an excellent introduction to time management games.